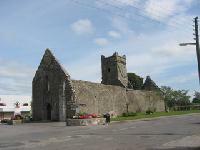 Dunmore is located 15kms north east of Tuam, near the borders of Roscommon and Mayo. Dunmore gets its name from the Irish D?n M?r, meaning large fort. The original fort was a stronghold for the ancient O'Connor kings, later dispossessed by the Norman DeBerminghams. Dunmore is surrounded by beautiful countryside, with old stone walls enclosing many fields, and coniferous forests in Cappagh, Lisduff and Drimbane.